The higher luminosity will certainly benefit ALICE, the LHC experiment dedicated to the study of the strong interaction and of the Quark-Gluon-Plasma (QGP), a state of matter which prevailed in the first instants of the universe and is recreated in droplets at the LHC by colliding lead ions. During Run 3, indeed, the interaction rate of lead ions will be increased to reach about 50 kHz, i.e. an instantaneous luminosity of L= 6×1027 cm-2s-1. This will allow ALICE to accumulate more than 10nb-1 of Pb-Pb collisions. Data samples of pp and p-Pb collisions will also be collected to measure the same observables in different interaction systems. The readout of the TPC and muon-chambers will be performed by the newly designed SAMPA chip, which is a 32-channel front-end analogue-to-digital converter with integrated digital signal processor. The new common online-offline (O2) system will transfer data from the detector directly to computers either continuously or with minimal trigger requirements. A new computing facility for the O2system is being installed at the experimental site. About 13.8 billion years ago, the universe was a hot, thick soup of quarks and gluons—the fundamental components that eventually combined into protons, neutrons and other hadrons. Scientists can produce this primitive particle soup, called the quark-gluon plasma, in collisions between heavy ions. But for the first time physicists on an experiment at the Large Hadron Collider have observed particle evidence of its creation in collisions between protons as well. The LHC collides protons during the majority of its run time. This new result, published in Nature Physics by the ALICE collaboration, challenges long-held notions about the nature of those proton-proton collisions and about possible phenomena that were previously missed. Scientists at the LHC and at the US Department of Energy’s Brookhaven National Laboratory’s Relativistic Heavy Ion Collider, or RHIC, have previously created quark-gluon plasma in gold-gold and lead-lead collisions. In the quark gluon plasma, mid-sized quarks—such as strange quarks—freely roam and eventually bond into bigger, composite particles (similar to the way quartz crystals grow within molten granite rocks as they slowly cool). These hadrons are ejected as the plasma fizzles out and serve as a telltale signature of their soupy origin. 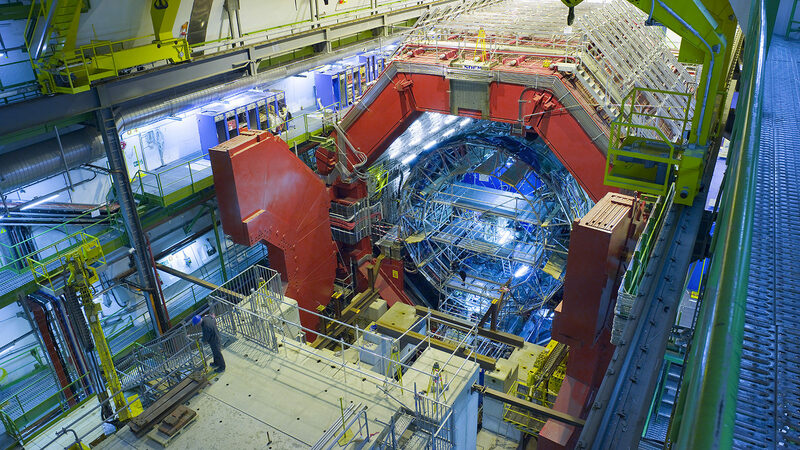 ALICE researchers noticed numerous proton-proton collisions emitting strange hadrons at an elevated rate. From a theoretical perspective, a proliferation of strange hadrons is not enough to definitively confirm the existence of quark-gluon plasma. Rather, it could be the result of some other unknown processes occurring at the subatomic scale. Earlier research at the LHC found that the spatial orientation of particles produced during some proton-proton collisions mirrored the patterns created during heavy-ion collisions, suggesting that maybe these two types of collisions have more in common than originally predicted. Scientists working on the ALICE experiment will need to explore multiple characteristics of these strange proton-proton collisions before they can confirm if they are really seeing a miniscule droplet of the early universe. This finding comes from data collected the first run of the LHC between 2009 and 2013. More research over the next few years will help scientists determine whether the LHC can really make quark-gluon plasma in proton-proton collisions. Other experiments, such as those using RHIC, will provide more information about the observable traits and experimental characteristics of quark-gluon plasmas at lower energies, enabling researchers to gain a more complete picture of the characteristics of this primordial particle soup. 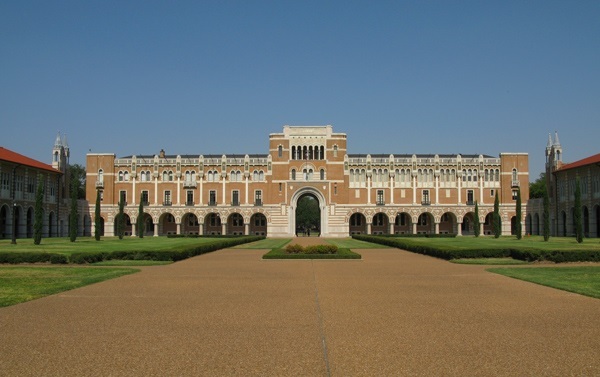 Findings from Rice University physicists working at Europe’s Large Hadron Collider (LHC) are providing new insight about an exotic state of matter called the “quark-gluon plasma” that occurs when protons and neutrons melt. As the most powerful particle accelerator on Earth, the LHC is able to smash together the nuclei of atoms at nearly the speed of the light. The energy released in these collisions is vast and allows physicists to recreate the hot, dense conditions that existed in the early universe. Quark-gluon plasma, or QGP, is a high-energy soup of particles that’s formed when protons and neutrons melt at temperatures approaching several trillion kelvins. In a recent paper in Physical Review Letters written on behalf of more than 2,000 scientists working on the LHC’s Compact Muon Solenoid (CMS) experiment, Rice physicists Wei Li and Zhoudunming (Kong) Tu proposed a new approach for studying a characteristic magnetic property of QGP called the “chiral magnetic effect” (CME). Their approach uses collisions between protons and lead nuclei. CME is an electromagnetic phenomenon that arises as a consequence of quantum mechanics and is also related to so-called topological phases of matter, an area of condensed matter physics that has drawn increased worldwide attention since capturing the Nobel Prize in physics in 2016. QGP was first produced around 2000 at the Relativistic Heavy Ion Collider in New York and later at the LHC in 2010. In those experiments, physicists smashed together two fast-moving lead nuclei, each of containing 82 protons and 126 neutrons, the two building blocks of all atomic nuclei. Because the melting protons in these collisions each carries a positive electric charge, the QGPs from these experiments contained enormously strong magnetic fields, which are estimated to be about a trillion times stronger than the strongest magnetic field ever created in a laboratory. The chiral magnetic effect is an exotic asymmetric electromagnetic effect that only arises due to the combination of quantum mechanics and the extreme physical conditions in a QGP. The laws of classical electrodynamics would forbid the existence of such a state, and indeed, Li’s inspiration for the new experiments arose from thinking about the problem in classical terms. “I was inspired by a problem in an undergraduate course I was teaching on classical electrodynamics,” Li said. Two years ago Li discovered that head-on collisions at LHC between a lead nucleus and a single proton created small amounts of particles that appeared to behave as a liquid. On closer analysis, he and colleagues at CMS found the collisions were creating small amounts of QGP. In the new paper, Li, Tu and their CMS colleagues showed evidence from proton-lead collision data that helps shed light on the electromagnetic behaviors that arise from the chiral magnetic effect in lead-lead QGPs. Li said more details still need to be worked out before a definitive conclusion can be drawn, but he said the results bode well for future QGP discoveries at the LHC. The research is supported by the Department of Energy, the Robert Welch Foundation and Alfred Sloan Foundation. Interview with Luciano Maiani, DG of CERN from 1999 to 2003, who gave the announcement talk of the discovery of QGP at the SPS. About 25 years after its first theoretical prediction, the new state of matter called quark-gluon plasma (QGP) was observed at CERN’s SPS. The public announcement was made on the 10th of February 2000 by Luciano Maiani, Director General of CERN back then. At the event organized by ALICE to celebrate the 30-year anniversary of the first heavy-ion collisions at the SPS, Maiani gave his account of this piece of history of physics. We had an interview with him after the seminar. After one year of mandate as DG of CERN you had the honour and the responsibility to announce that evidence of the existence of QGP had been found at the SPS. How did you live these happenings? At that time I was not an expert in heavy ion physics, because I hadn’t worked in the field. Nevertheless, I was aware of the phase transition issue and of the two existing visions about what happens to nuclear matter at very high temperature. On one side there was the theory that matter would break down into a gas of quarks and gluons (and temperature could be freely increased), on the other side the model of Hagedorn about the existence of an upper limit of the temperature reachable, which could be estimated from the hadron spectrum to be 170-180 MeV. With the development of QCD it was possible to combine these two models. In particular, in 1975 Nicola Cabibbo and Giorgio Parisi suggested that the Hagedorn limit temperature is just the critical temperature of a phase transition from a gas of hadrons, made of confined quarks, to a gas of deconfined quarks and gluons (the QGP). These works had convinced the experts in the field. When the moment came to decide whether to make a public announcement about what the SPS had found, I discussed with many of the people involved, such as Claude Detraz, who was Director for Fixed Target and Future Programmes during my mandate, Reinhard Stock and Hans Specht. After examining the data and collecting opinions, I concluded that we had convincing signals that what we were observing was indeed the quark-gluon plasma. But the public announcement was cautious, wasn’t it? Was there still some doubt? I think that the announcement was quite clear. I have the text of it with me, it reads: “The data provide evidence for colour deconfinement in the early collision stage and for a collective explosion of the collision fireball in its late stages. 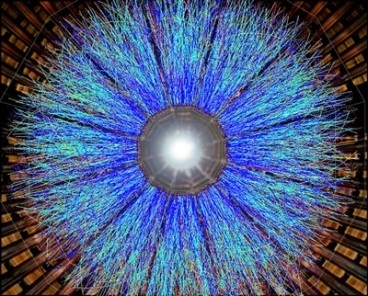 The new state of matter exhibits many of the characteristic features of the theoretically predicted Quark-Gluon Plasma.” The key word is “evidence”, not discovery, and the evidence was there, indeed. In the talk I gave at that time I also described the concept of quark deconfinement using an analogy with the snow on the Jura Mountain, which I particularly like. We can consider a quark as a skier: when the temperature is not very low, on the mountain there are only patches of snow in which the skier can move. When the temperature decreases and the snow increases, the skier can move along bigger and bigger spaces, up to a point where he or she can freely sweep long distances. The same can be said for a quark confined in a hadron (the patch), which becomes free when temperature increases. Of course at that moment the idea still popular was that we were dealing with a phase transition to a gaseous state in which quarks and gluons would be asymptotically free. Later RHIC showed that the situation is more complicated and that this new state is much more like a liquid with very low viscosity rather than like a gas. The announcement came just a few months before the start of the programme of RHIC. Were there some polemics about this “timing”? We were almost at the conclusion of a long and accurate experimental programme at the SPS, so making a summing up was needed. In addition, as I said, we thought there were the elements for a public announcement. And this has been proved right by later experiments. Somebody thought that it would make RHIC, which was going to enter in operation, appear useless. But that was not the case, since much more was left to study. Indeed in the same announcement talk I said: “the higher energies of RHIC and LHC are needed to complete the picture and provide a full characterization of the Quark-Gluon Plasma”. 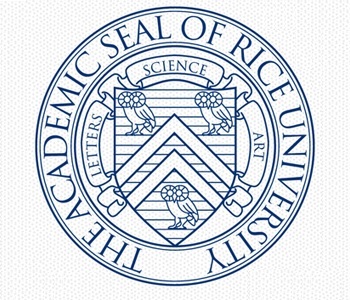 In your opinion, what is the future of this branch of research? Well, there are still many open problems, things that need to be studied further. It is very important to explore the properties of this new state of matter and the connected phenomena, to get a more precise physical picture of the new state. Personally, I think that there is also another possible line of research in this field: to study the production of those exotic hadronic resonances that are not included in the scheme of baryons and mesons (i.e. three quarks or quark-antiquark structures). These resonances have been observed in CMS and LHCb in pp collisions, and it would be interesting to study how they are produced in heavy-ion collisions. It could give us indications about what these objects are, tell us if they are molecules made of colourless hadrons or new states which are configurations of quarks and antiquarks (different from mesons) that include subcomponents connected by colour bounds. ALICE could provide an important contribution to this research. It is not easy to observe such exotic states in heavy-ion collisions but I think it is worth trying. Theorists and scientists conducting experiments that recreate matter as it existed in the very early universe are gathered in Chicago this week to present and discuss their latest results. These experiments, conducted at the world’s premier particle colliders — the Relativistic Heavy Ion Collider (RHIC) at the U.S. Department of Energy’s Brookhaven National Laboratory, and the Large Hadron Collider (LHC) at the European Center for Nuclear Research (CERN) — are revealing intriguing information about the building blocks of visible matter and the force that holds them together in the universe today. The Quark Matter 2017 conference (QM17) will feature new results describing the particles created as atomic nuclei smash into one another at nearly the speed of light at RHIC and the LHC. 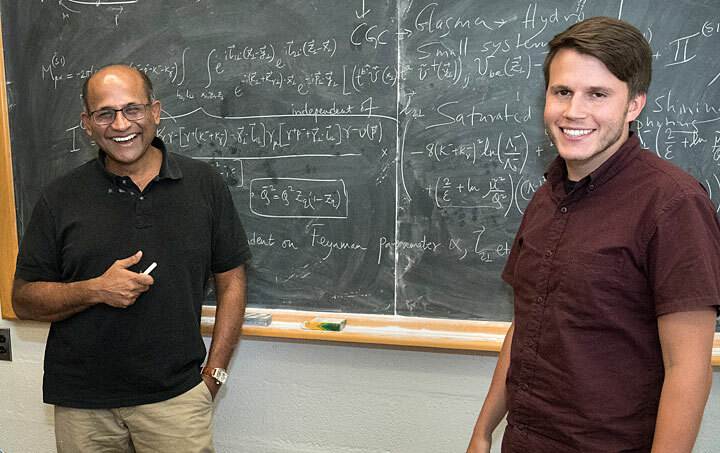 These “ultrarelativistic heavy-ion collisions” melt ordinary protons and neutrons, momentarily setting free their inner constituents — quarks and gluons — so scientists can study their behavior and interactions. The physicists want to sort out the detailed properties of the hot “quark-gluon plasma” (QGP), and understand what happens as this primordial soup cools and coalesces to form the more familiar matter of today’s world. The two scientific collaborations conducting nuclear physics research at RHIC—STAR and PHENIX, named for their house-sized detectors—will present findings that build on earlier discoveries at this DOE Office of Science User Facility. The two collaborations perform cross-checking analyses to verify results, while also exploiting each detector’s unique capabilities and strengths for independent explorations. The QM17 presentations will showcase precision measurements made possible by recent detector upgrades. The meeting will also feature talks on the planned upgrade of the PHENIX experiment to a new RHIC detector known as sPHENIX, which will have greatly increased capabilities for tracking subatomic interactions. In addition, at least one talk will focus on the scientific rationale for building an Electron-Ion Collider, a proposed future facility that would enable an in-depth exploration of gluons in protons and other nuclei, opening a new frontier in nuclear physics. Before RHIC began operations in 2000, nuclear physicists suspected it would take collisions of large nuclei such as gold to produce enough heat to create quark-gluon plasma. Since then, RHIC’s gold-gold smashups (and later collisions of lead nuclei at the LHC) have reliably recreated a soup of quarks and gluons that flows like a nearly “perfect” liquid with extraordinarily low viscosity. Scientists detect the flow by observing correlations in certain characteristics of particles streaming from the collisions even when they are relatively far apart. More recently, smashups of smaller nuclei such as helium and even single protons with the large nuclei have produced correlation patterns that suggest that smaller drops of QGP might be possible. The latest results, to be presented by PHENIX, come from collisions of protons with aluminum nuclei, and also from deuteron-gold collisions over a range of collision energies. Lowering the energy changes how long the QGP phase lasts, which should change the strength of the correlations. The new results also include the first analysis of particles emerging closest to the colliding beams in the forward and rearward directions, as tracked by the recently installed Forward Silicon Vertex Tracker. Adding this tracker to detector components picking up particles emerging more centrally, perpendicular to the colliding beams, gives the physicists a way to test in three dimensions how the correlations vary with the pressure gradients created by the asymmetrical collisions. A virtual tour of the PHENIX detector at the Relativistic Heavy Ion Collider (RHIC). PHENIX’s Central Barrel and Forward Silicon Vertex Tracker and STAR’s high precision Heavy Flavor Tracker (HFT) give RHIC physicists access to studying the behavior of so-called heavy quarks, which go by the exotic names of “charm” and “bottom.” These particles, produced in the QGP, start to decay into other particles a short distance from the collision zone, but those decay products eventually strike the trackers. By tracing their tracks, scientists can identify precisely where the decay took place. And since charm and bottom quarks have slightly different lifetimes before decaying, and therefore different travel distances, this method gives the scientists a way to tell them apart. One way scientists will use this data is to see how heavy quarks are affected by the QGP, and whether there are differences among them. Earlier indirect findings by PHENIX, later confirmed by STAR, already indicated that heavy quarks get swept up in the flow of the QGP, somewhat like a rock getting pulled along by a stream instead of sinking to the bottom. These observations formed part of the motivation for the construction of the STAR HFT. New data from the HFT to be presented by STAR provide the first direct evidence of heavy quark flow, and show that the interactions of these heavy particles with the QGP medium are strong. STAR’s HFT is the first application of the silicon based Monolithic Active Pixel Sensor technology in a collider environment. The measurements show that the flow of a type of heavy particles called D0s, which contain a charm quark, follows the same trend as seen for lighter particles and can be described by the same viscous hydrodynamics. The unprecedented precision in this measurement will pave the path towards precisely determining one of the intrinsic transport properties of the QGP and tell us how quarks interact with it. PHENIX will present precision results from its Central Barrel Vertex Detector showing that some heavy quarks are more affected by the QGP than others. The results show that charm quarks lose more energy in the QGP than heavier bottom quarks. With this high statistics data set, PHENIX will now be able to study how the energy-loss is affected by how central, or head-on, the collisions are. PHENIX will also present its first heavy-quark result from the Forward Silicon Vertex Tracker, measuring the total cross section of bottom quarks emerging in the forward and rearward directions in collisions between copper and gold ions. A virtual tour of the STAR detector at the Relativistic Heavy Ion Collider (RHIC). The STAR HFT has also made it possible to make the first measurements of a particle called Lambda c emerging from RHIC collisions. Lambda c is made of three quarks—just like protons and neutrons—but with one of the three being a heavy quark. These Lambda c particles are extremely difficult to tease out from the data. But because they can only be created in energetic particle collisions, they carry unique information about the conditions within. Studying this “sentry” information carried by the Lambda c should help scientists learn how relatively “free” quarks that populate the early-stage QGP eventually coalesce and combine to form the more familiar composite particles of ordinary matter. Observing how jets of particles springing from individual quarks or gluons lose energy, or get “quenched,” as they interact with the medium has been one major sign that RHIC’s energetic collisions of gold on gold were forming QGP. STAR will present several new jet studies that provide further insights into both how this quenching occurs and how the lost energy re-emerges, In addition, PHENIX will present new results exploring the question of whether collisions of smaller particles with gold, which appear to create the flow patterns of QGP, also show evidence of jet quenching. Their results include data on jet energy loss in a variety of collision systems, both large and small. The method uses photons emitted opposite the jet to calibrate how much energy the jet should have to determine whether or not there was quenching. The data show some modifications to the jet structure and the yield of high-momentum particles inside the jets, but it is not yet clear how to interpret these results. Tracking heavy quarks and particles made from them gives RHIC physicists a new way to zero in on a more precise temperature of the QGP—already known to be more than 250,000 times hotter than the center of the sun. The new precision comes from measuring how different bound states of heavy quark-antiquark pairs, held together with different amounts of energy, melt in the plasma. STAR counts up different types of these particles (for example, Upsilons, pairs of bottom and anti-bottom quarks, that come in several binding varieties) using another recently upgraded detector component called the Muon Telescope Detector. Muons are the decay products of the Upsilons. STAR uses these counts to look for a deficit of one type of Upsilon relative to another to set boundaries on the QGP temperature. The physicists are eager to compare their results with those from the LHC, where with higher collision energies, they expect to see higher temperatures. PHENIX’s measurements of temperature have relied on tracking photons, particles of light, emitted from the hot matter (think of the glow of an iron bar in a blacksmith’s fire, where the color of the light is related to how hot the iron is). But PHENIX’s photon data have uncovered something unusual: While collisions initially emit photons equally in all directions, fractions of a second later the emitted photons appear to have a directional preference that resembles the elliptical flow pattern of the perfect liquid QGP. This is intriguing because photons shouldn’t interact with the matter—or even be produced in such measurable quantities as the matter produced in the collisions cools and expands. To explore this mystery, PHENIX measured thermal direct photons at different gold-gold collision energies (39, 62, and 200 billion electron volts, or GeV), as well as in the smaller collision system. The results they present will shed light on the sources of these direct photons. RHIC physicists are also learning more about “cold” nuclear matter—the state of the nucleus, filled with a field of gluons, before it collides—and how to account for its effects when studying the hot QGP. In order to disentangle the effects of cold nuclear matter, PHENIX is comparing the suppression of the excited state of the bound charm-anti-charm particle known as Psi to its ground state. They are studying collisions of protons and helium with gold or aluminum—small systems where cold nuclear matter predominates—and will use these as a baseline for better understanding the sequential melting of the bound states in the hot QGP. Their findings indicate that the less tightly bound version of the Psi is more than twice as susceptible to the effects of cold nuclear matter than the more tightly bound version. This effect must be accounted for in analyzing the data from QGP-creating collisions where the presence of both cold and hot nuclear matter influences the results. STAR has exploited RHIC’s ability to collide nuclei over a wide range of collision energies, conducting a Beam Energy Scan to explore the creation of QGP and its transition to ordinary nuclear matter over a wide range of conditions. 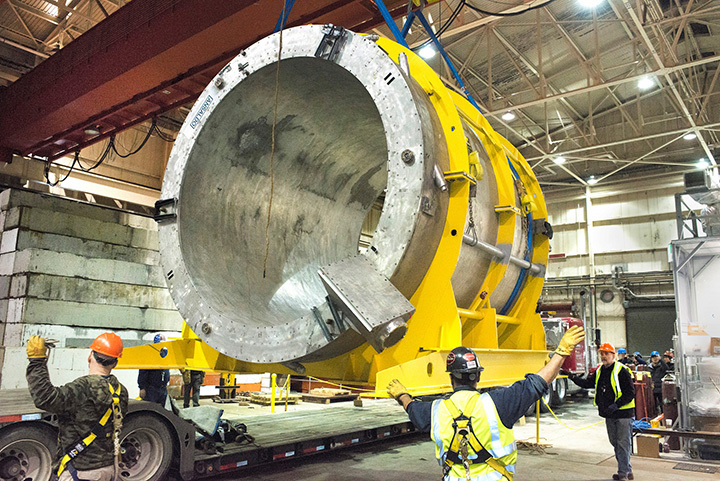 At QM17 they’ll present data from collisions at the lowest energy yet. Instead of colliding one beam into the beam coming into the detector from the opposite direction, as occurs in most RHIC experiments, STAR placed a stationary target (a foil of gold) within the beam pipe inside STAR and aimed just one beam at the target. Like a collision in which one moving car crashes into one that is parked, this fixed-target collision lowered the impact compared to what would occur if both beams (or cars) were moving and colliding head on. Data from these low energy collisions will be an integral part of phase two of the Beam Energy Scan, which is enabled by improvements to the RHIC accelerator complex that allow for higher collision rates. Research at RHIC is funded primarily by the U.S. Department of Energy’s Office of Science and by these agencies and organizations.